So after a few trips up north, Bierebelle is stuck in the south, so what does a girl do for fun here? Today I went for a little explore to see what Salisbury has to offer. I had a little ulterior motive too; although I have a weekly coffee delivery from Hasbean which is awesome, I still crave my visits to the exceptional Quetzal Coffee on the Saturday market. That chap is a legend – he sources and roasts his coffee personally and his Old Brown Java is second to none! But a girl can’t live on coffee alone, and I certainly couldn’t drink the coffee beans till I got home. 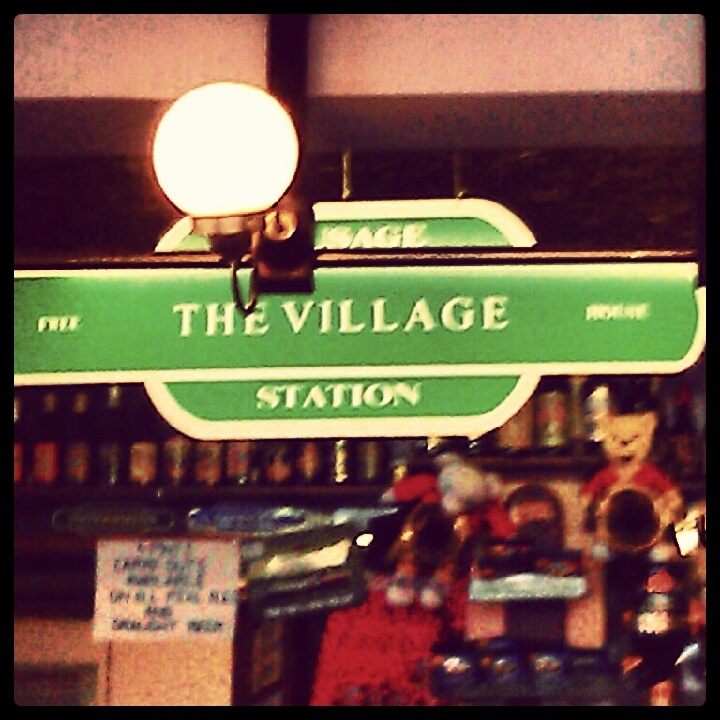 Thanks to the Twitter hive mind, I had a few places in mind so first stop was The Village. Well I can’t believe I hadn’t found this place before! So close to the station but a real hidden gem in the opposite direction to the city center. I knew I was onto a winner looking at the bar policy on the chalk board outside; 5 real ale pumps dispensing Downton Quadhop, Tim Taylor‘s Landlord, two guests and a dark. Refreshing to see that commitment to darks even at this time of year, especially at this end of the country. I can almost forgive the Landlord! There’s even a whiteboard in the pub saying what’s on next board and space to write requests! This place is a little shabby and smells proper pubby but it’s got character. There’s an awesome vintage collection of bottles on a shelf behind the bar and loads of train memorabilia. It does carry out, Sky Sports, even yummy Snyders of Hannover treats. First selection from the Village pumps was the Box Steam Tender Mild (3.6%ABV) which turned out to be a pretty good drop for a mid-morning. Quite thin feeling but lots of sweet blackcurrant aroma and hedgerow berries flavour with bitterness at the end. The OH had Downton Eurohop (4.4%ABV). Fairly acceptable but not really my thing. The main characteristic seemed to be bitterness. My next choice was Sarah Hughes Dark Ruby (6%ABV) which unexpectedly had the dark looks and thin body of a Cola with tiny bubbles. The OH thought it might have been bottom of the barrel, given the sourness, but I didn’t mind since it was quite refreshing. There was quite a bit of tongue tingling sour cherries or raspberries and a fruity red wine vinegar aroma – quite unusual. The boy went for a Liverpool Craft Beer IPA which turned out to be a lovely satisfyingly rich beer with lots of herby lemony hops and a big hoppy aroma. After a little wander round the shops and a bite to eat, we headed on to the Wyndham Arms, Hop Back‘s first pub. Unsurprisingly, all 6 hand pumps were devoted to Hop Back, a brewery I have mixed feelings about. I love their Entire Stout and Summer Lightening is fine for a hot day, but I find a lot of their stuff is variations on the same theme so I was fairly disappointed that all 6 pumps were devoted to the paler side. Although it is June would it be too much to ask for Entire Stout? Unlike their Southampton bar, The Waterloo (in my opinion a warmer, more lively place), there were no guests-pumps although Fosters, Thatchers and Murphys were on tap to placate non-beer lovers. Since I was there, I had a half of Pioneer (3.7%ABV) which is a perfectly fine amber ale for summer but nothing exceptional. Easy drinking, unoffensive honey and cereal aromas with a slight citrus zing and long bitter finish. The OH was slightly more impressed at the Heracles (2.8%ABV) since, for a very low strength pale it was fairly satisfying and had an admirably hoppy flavour. 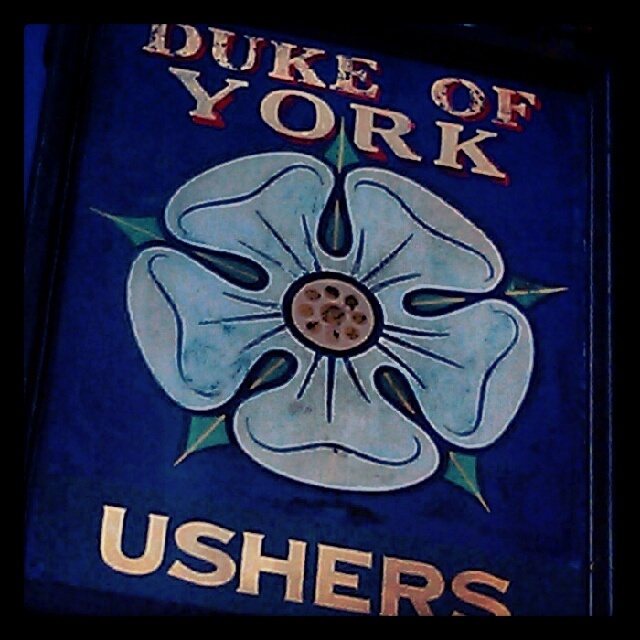 So after the Wyndham there was just enough time left to check out Twitter-reccomended pub number 3, the Duke of York, another very traditional little pub near to The Village. Again, the decor was slightly shabby but this was a place which cared about beer and displayed a nice selection of pump-clips and old posters. On the mantlepiece was a fairly admirable library of Good Beer Guides going back to late 80s, as well as other beer and whiskey publications. I always like to sit in a pub where the staff and punters are chatting about beer too, especially the more opinionated ones. Favorite overheard quote in The Duke of York? ‘Green King Abbot I wouldn’t give you tuppence for!’ Although I did note the Stella, Becks Vier and Red Stripe taps but I guess they need to cater to those crazy fools who don’t like beer too. On the bar, I was most excited to see a certain little red barrel proudly sitting there. As CAMRA would say, you haven’t lived until you’ve had Watneys Red Keg but I wanted to try one of the Duke’s guests instead so maybe next time (plus poor old Watney’s is no more). I selected a Jennings Tom Fool (4%ABV) which was an easy drinking amber ale; bitter, spicy, a little touch of sweet toffee apples. I could imagine this is nice in autumn, although I have a feeling it’s a seasonal offering for summer. Not amazing but a good little sup. My sturdy drinking companion had a Shardlow Five Bells (5%) which wasn’t dreadful but just wasn’t that interesting. A little dark roasty malt but not a lot else. So Salisbury, of course I’ll be back for the coffee, and so far two out of three pubs will see me again. Not a bad start to my beery adventures down south! The Wyndham is a strange place: sometimes I’ve been there and been made to feel very welcome and other times I’ve felt like I’m not really meant to be there. And I’ve always found it sad that it never has a guest beer on… at least never when I’ve been in. Yes we thought the same. It’s probably great as a local but because the lady serving seemed to know everybody it felt a bit like we were trespassing in somebody’s front room. The Waterloo feels a lot more welcoming (actually get a little banter at the bar). Might want stretch your legs further up the wilton road to the halfway house next time you visit village got six handpulls on and a ever rotating list plus Czech, German & English craft draught beer. Just getting going here so we are still relatively unknown!